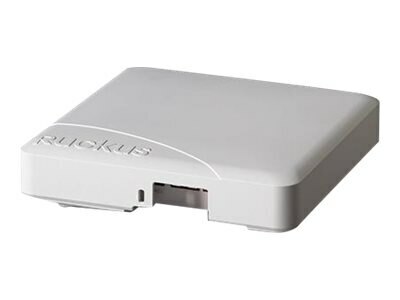 The Ruckus ZoneFlex R600 indoor AP is optimized for mid-sized organizations requiring higher performance and support for more devices. BeamFlex+ adaptive antenna technology directs each packet over the best performing signal path, extending coverage range and mitigating interference automatically. ChannelFly technology chooses the best channel to give users the highest throughput - delivering up to 50 percent capacity gain over competitive dynamic channel selection approaches. Whether organizations are deploying ten or ten thousand APs, the R600 is also easy to manage through the appliance, virtual and cloud management options. The R600: Supports up to 512 clients on a single AP; Supports more services - including streaming HD media, cloud applications, web browsing, and email; Easily handles the transmission of challenging content - including jitter and latency sensitive streaming HD media; Uses fewer APs to cover more area with extended range capabilities; Improves throughput automatically delivering up to 50 percent capacity gains; Provides more more wireless coverage and reduces costs with less cable runs; Reduces costs with support for both standard PoE and PoE+.